Rosie, the humanoid robot, cleaned house for the Jetsons on the 1960s TV cartoon. 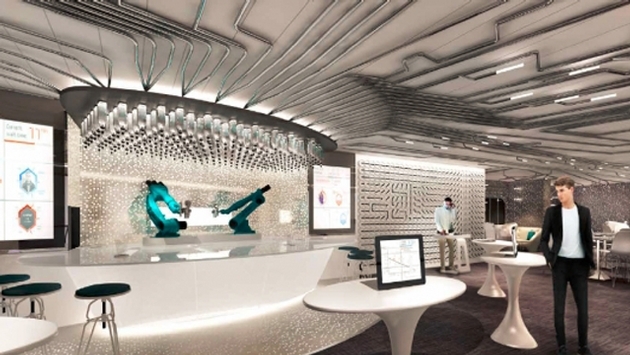 But we much prefer the robots on Royal Caribbean’s new Quantum of the Seas — they’ll shake martinis and blend daiquiris as requested by guests placing orders on tablets at their tables. “Our robots will actually prepare drinks,” Fain said at a press conference at the Meyer Werft shipyard in Papenburg, Germany, where the Quantum is two months from entering service. RELATED: Interview with Richard Fain, Chairman and CEO of Royal Caribbean Cruises, Ltd. The two cocktail-making robots in the aptly named Bionic Bar won’t be humanoid like the Jetsons’ Rosie, but will look more like the robotic arms that help build cars in factories, Fain said. But human bartenders will still staff the bar for those who don’t want to order by tablet and to ensure patrons are of legal drinking age, he said. However, it’s not likely that the robotic bartenders will sympathetically listen to your problems and offer sage advice. The robotic bartenders were just one of the eye-popping technological innovations unveiled at an event at the shipyard, which also is building Quantum’s sister ship Anthem of the Seas. Quantum, described by the line as the SMART Ship, will have “boatloads of bandwidth” and RFID technology — which stands for radio-frequency identification and allows the wireless transfer of data — that will transform other aspects of the cruise vacation. For example, guests will be able to receive digital boarding credentials at home, cutting the check-in time at the cruise terminal to 10 minutes from sidewalk to ship, Fain promises. No more stopping at a check-in counter and no more lines. Luggage will be tagged curbside with the RFID technology so guests can monitor their bags’ progress to the stateroom on their smart phones. The process is reversed on departure. Quantum of the Seas also will offer new RFID wristbands that require only a simple tap to navigate the ship, make onboard purchases or open the stateroom door. The ship also will boast unprecedented bandwidth that is “more than all other cruise ships in the world combined,” Fain said. It will use satellites launched by O3b Networks, Royal Caribbean’s partner company, which specializes in providing Internet access to remote parts of the world. Fain says the Internet connections on Quantum will be as fast as onshore on any personal device carried onboard. Also new are two apps that help guests plan and organize their cruise. Cruise Planner allows guests to research and book dining reservations, shore excursions, spa appointments and more before they board the ship. Royal iQ, available both as an app and at freestanding stations around the ship, shows guests at-a-glance views of their vacation schedule and also lets them keep in touch with one another and home via phone and text capabilities. To help guests maximize their use of personal devices, staterooms will have device-charging USB outlets, as well as energy efficient and environmentally friendly lighting systems. The ship eliminated incandescent bulbs and instead uses low-energy LED or fluorescents. Motion sensors even dim hallway lighting when no one is present. What’s more, every crew member will get a Microsoft tablet — that’s 40,000 the company is giving to shipboard employees in total — to help them keep track of guests’ tastes and preferences, whether it’s a gluten-free diet, early show seating or shiatsu massage. The 167,800-gross-ton Quantum of the Seas will accommodate 4,180 guests double occupancy or up to 4,905 total if all third and fourth berths are filled. The ship will enter service in November in Bayonne, N.J., through May, when it will reposition to Shanghai, China. Sister ship Anthem of the Seas will operate from Bayonne starting in November 2015. The Quantum and Anthem of the Seas will have more jaw-dropping features, including a sky-diving simulator, an indoor sports complex with bumper cars and roller skating, and the North Star, a thrill ride that will carry people 300 feet into the sky in a glass pod on a massive cherry-picker-type device.